Robert talks about his success in getting artists to work with him on the Black Radio 2 project by using twitter. He is currently enjoying a successful hit R&B record on Urban AC formats with the track "Calls" featuring Jill Scott. What is amazing about his last two R&B jazz influenced albums is the roster of talent that has worked with him on the two projects. The first Black Radio album featured Lupe Fiasco, Common, Yasiin Bey (Mos Def), Erykah Badu, and many others. He's hardly a newcomer having released his first album in 2005 for Blue Note. He now is branching out with his second critically acclaimed album. 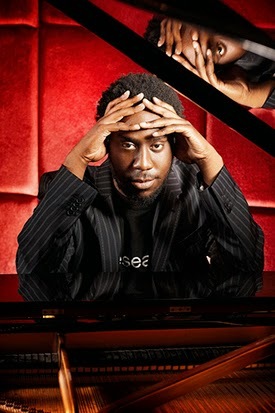 From robertglasper.com- - Breakthrough success can often be a tough act to follow. But with a little help from some notable friends, Robert Glasper Experiment is set to up the ante with the follow-up to his successful GRAMMY-winning album Black Radio. Flaunting a diverse array of featured guests including Common, Patrick Stump of Fall Out Boy, Brandy, Jill Scott, Dwele, Marsha Ambrosius, Anthony Hamilton, Faith Evans, Norah Jones, Snoop Dogg, Lupe Fiasco, Luke James, Emeli Sandé, Lalah Hathaway, and Malcolm-Jamal Warner, Black Radio 2 is certain to surprise and delight critics and fans alike. With a unique fusion of R&B, jazz, and hip-hop that brazenly traverses the boundaries of all three genres, Black Radio 2 finds Glasper and his musical cohorts creating in a vibrant new chasm, brilliantly contrasting its predecessor in the process.